November has begun on the chilly side, as temperatures on several mornings this week have dipped into the 20’s. Earlier in the week, as well as this morning, small ponds in the area have been topped with a fine sheet of ice, and our cars have required some frost removal attention. The added winds around midweek made us consider our heavier jackets and coats, but today the breeze is slight and we’re due for a bit of a sunny warm-up through the weekend (possibly reaching the low 60’s again). By Tuesday of next week temperatures should feel November-ish again, with a chance of cold showers (and possibly snow) on several days. Tomorrow is the opening day of the firearm deer hunting season for Minnesotans. If you’re out walking in some wild areas in the country, be sure to wear your blaze orange! Here in the Linnaeus Arboretum, however, hunting is not allowed, which means the entire Arb is a safe haven for deer. And this isn’t just an assumption; as if the deer themselves know what tomorrow brings, 8 different individuals (including 5 bucks and 3 does) have been spotted in the Arb over the past two days, mostly in the deciduous and coniferous forests. The deer rut has already begun (in which males are becoming territorial and seeking females), which is partly why we’re seeing more deer activity in the area as of late; deer tracks were even seen in the gardens behind the Interpretive Center earlier in the week. 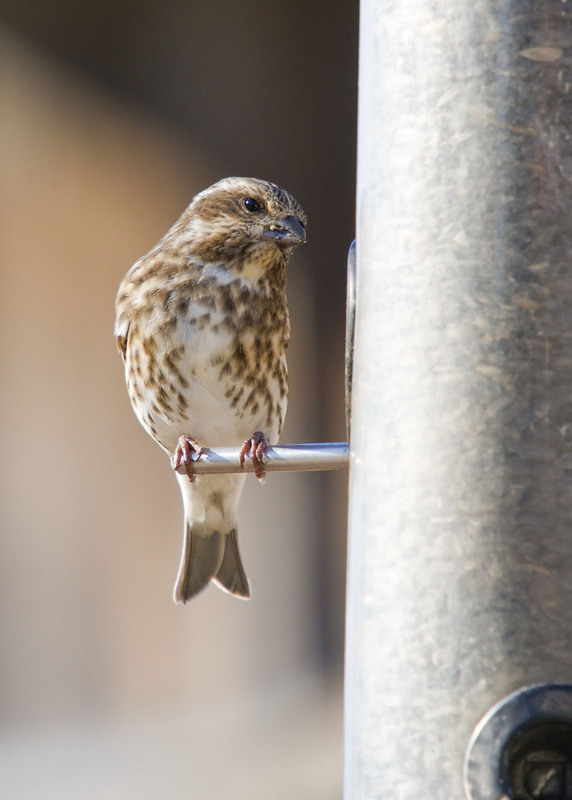 Female Purple Finch feeding on black oil sunflower seeds at feeders behind Interpretive Center, 11/3/10.